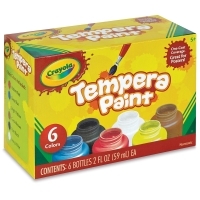 Crayola Tempera Paint provides ultimate opacity and coverage. 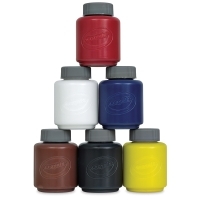 The creamy consistency dries to a matte finish that won’t crack or flake. It works well on many absorbent surfaces like construction paper, cardboard, and papier mâché. Set of 6 — This set contains 2 oz bottles of Radiant Red, Deep Blue, Bright Yellow, Cocoa Brown, Pure Black, and Ivory White.